There’s exciting, ground-breaking research on brain tumors in dogs being done by G. Elizabeth Pluhar, DVM, PhD and John Ohlfest, PhD and their colleagues at the University of Minnesota. The Canine Brain Tumor Clinical Trial Program they direct seeks to further cutting edge brain tumor treatment using dogs with naturally-occurring brain tumors — the same tumors that humans get. 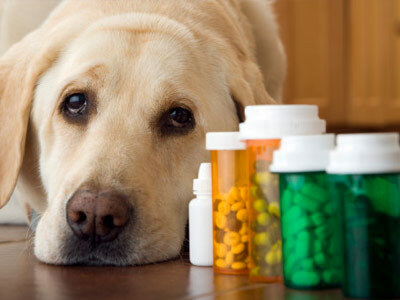 Their goal is to offer therapy intended to preserve quality of life for the dogs and improve long-term survival rates. Additionally, they use the information gained from treating dogs to design similar treatments for people with brain tumors. Brain tumors occur in dogs more frequently than they do in humans: 20 per year per 100,000 canine populations at risk compared with 18.1 per 100,000 humans. Canine glioma, an aggressive type of brain tumor, occurs most frequently in brachycephalic breeds (those with a broad, short skulls) such as Boxers and Boston terriers, although the tumors occur in other breeds, as well. 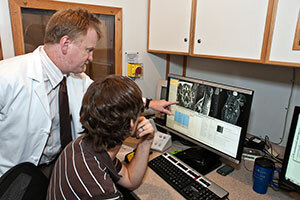 Researchers have found that there are a number of similarities between canine and human brain tumors. To date, Dr. Pluhar has treated more than 70 dogs — and I have used their protocol to treat dogs in my practice, as well. Dogs are diagnosed via brain MRI, both with and without biopsy. I have done these procedures and have sent two dogs from UPENN to Minnesota for further treatment. Both are doing well—one nearly six months and the other nearly a year after treatment. Traditional therapy for canine brain tumors has been a combination of steroids and radiation, but we haven’t been satisfied as the therapies haven’t been curative nor have they extended the dog’s life beyond a few months. Dr. Pluhar and her colleagues are using a combination of surgery, gene therapy and vaccine therapies — treatments that are less toxic and are proving to be more successful. The Canine Brain Tumor Clinical Trial Program is a collaborative effort of the University of Minnesota’s Veterinary Medical Center and Masonic Cancer Center, in which the medical researchers led by human neurosurgeons, Drs. Steven Haines and Matthew Hunt, and the veterinarians are working together to diagnose and treat canine brain tumors with breakthrough therapies. The expectation is that these new therapies may also be used to help people. The program will consider any dog that has a tumor that originated in the brain, as long as the dog and owner have the ability to complete the trial, which typically lasts six months. The majority of costs associated with these experimental brain tumor therapies at the University of Minnesota — up to $15,000 — is paid for by grants from foundation and government agencies including the Children’s Cancer Research Fund, the Randy Shaver Cancer Research and Community Fund, the National Institutes of Health, the American Cancer Society, and the American Brain Tumor Association. I would encourage any veterinarians who have a patient that they suspect has a brain tumor—or pet owners whose dog has been diagnosed with a brain tumor—to give me a call at (410) 224-0121 to see if these ground-breaking therapies could be of help.